For some, Muse’s 2012 album ‘The 2nd Law’ was a welcome change of pace. Tapping into the 2012 musical zeitgeist for bombastic Bond themes and dubstep wobbles, it saw the band trying something new and proving their ability to adapt their sound to any genre. For others it was m-m-m-m-m-madness. At the very least, the new songs didn’t rock as hard when performed live. ‘Drones’ is for those fans. In many ways it’s a return to form, if somewhat predictable. Opening with the staccato jabs of Dead Inside, it’s clear that guitars are back at the forefront of the band’s sound. Short, simple riffs are the order of the day, sometimes even overwhelming Bellamy’s formidable falsetto. Psycho, for instance, eschews any electronic influences for a strutting rock track of screeching guitars and simple chord progressions, whilst the pairing of Reapers and The Handler at the album’s centre is just pure sucker-punching guitars (with a few Muse-isms for good measure). Later, Defector takes a more psychedelic route, though its riffs are no less dazzling. In many ways, there’s a similarity with their label-mates Royal Blood and their penchant for punchy riffs. ‘Drones’ re-establishes Muse as a rock band first and foremost – few bands can rock as hard as them. There remain dapples of trademark electronics. Mercy is one of the Muse-iest Muse songs to exist, with its roaring guitars, striking piano chords, simmering synth arpeggios and a soaring sing-along chorus. Revolt, towards the album’s conclusion, is a lighter affair; it’s followed by Aftermath that’s (appropriately for its name) a more sombre, Pink Floyd-esque power ballad that showcases Bellamy’s traditional songwriting abilities. As a whole, the album doesn’t quite stand up to the band’s past material, missing the scratchy metal sounds of their earlier work, but it certainly repositions them as the UK’s premiere rock act. Of course, this wouldn’t be a Muse album without some classicism and weirdness. The Globalist is a ten minute epic that travels from Morricone-esque cinematic strings and whistles, to blazing guitars and dramatic choirs, to grandiose piano that almost references Elgar’s Nimrod. It’s followed by the title track: Baroque vocal counterpoint that wholeheartedly shows off Bellamy’s vocals. It feels tacked on as an afterthought, however. Most of that trademark weirdness comes in the lyrics, not to mention two skits entitled Drill Sergeant and JFK. Lyrically, this is just as lofty, scientific and bizarre as usual – in fact it’s a concept album of sorts about a dystopian society of robots, exploring governments, technology and revolution. Sure thing Matt. 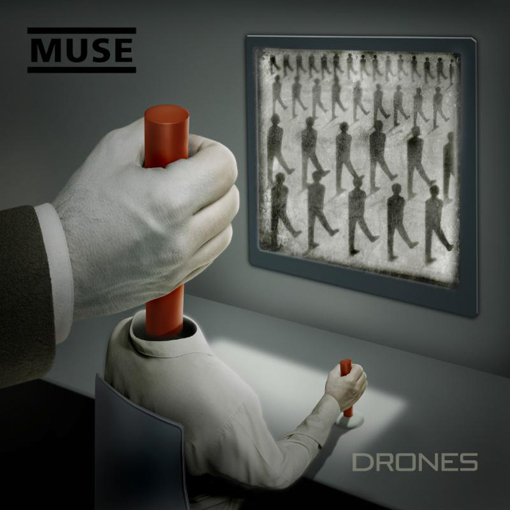 ‘Drones’ then sees Muse returning to what they’re best at: confusing and delighting in equal measure. It might be predictable, but thankfully some things never change. Listen: ‘Drones’ is available now.